An interesting article in the New York Times, where the author tries the first sous-vide cooking appliance for the home cook. What is sous-vide? Well it's French for "in a vacuum" for starters, but as a cooking technique it means to vacuum seal uncooked food in a bag, and then put said bag into a heated water bath for several hours on up to days... the bath being held at a temperature well below boiling (and thus well well bellow traditional cooking temperatures). It seems you set your water temperature to a bit higher than you want the core temperature of your food to be when it is finished cooking... so for a medium rare steak you go somewhere in the 130-140 degree range... and then you can basically cook it forever and not overcook it. It takes some number of hours (based on thickness) to for the meat to reach that temperature throughout and it will never exceed it, and thanks to the vacuum seal it won't dry out. It will come out looking pale and undercooked, but you can throw it in a skillet for a bit to develop a nice crust... and then you have your entire piece of meat perfectly cooked, instead of needing to overcook half of it to get the center just right. I had only vaguely heard of this technique before... though I believe Alton Brown goes on at length about the merits of long slow cooking at a low temp in "I'm Just Here for the Food"... but it is intriguing to say the least. I can certainly see the merits from a restaurant's perspective. You can cook things to an exact internal temperature days before you need them... and then just fire them in a saute pan for a few minutes before serving. What more could you ask for for putting out a consistent product? At the same time, while I can certainly see the benefits and logic behind it, it just doesn't seem like any fun. As Thomas Keller said (he himself a fan of the technique): “Eliminate the need to pay attention and you eliminate the craft.” I guess you could argue that with the craft of cooking food to "perfectly done" taken care of, you can focus more of your energies on flavor combinations and plating and all the other aspects of making a wonderful meal... but I dunno. I think I'll stick with traditional approaches. 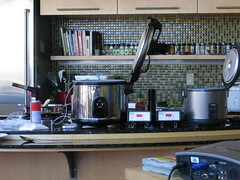 However, if, unlike me, you want to give it a shot... but don't want to spend the $450 (plus vacuum sealer) for the "SousVide Supreme" mentioned in the article, you can buy the $140 "Sous Vide Magic" that can control a crock pot or rice cooker heating element accurately enough to use for your water bath.